Runs for Cookies: Kind of a big deal! Today was my long run for the week, and I think I'm starting to feel back to my old self! For the past couple of weeks, my heart rate was elevated much higher than normal when running, and I had no idea what it was from. Last week, I felt awful while running just five miles on the treadmill; mentally, I was feeling great, but my body just physically wanted nothing to do with running. Anyway, we got several inches of snow yesterday, and the streets weren't plowed this morning. Instead of doing the treadmill (again), I decided to go to the Metropark. I called them first, to make sure that the paths were cleared of snow, and I headed out at around 11:00--kind of late to start my run, but I was doing a bunch of online banking stuff all morning. When I got to the Metropark, I was disappointed to see that the paths weren't really all that clear. They'd been plowed, but there was still a lot of snow/ice on the path. Considering I'd just driven 20 minutes to get there, I decided to run anyway, and just take my time so I didn't slip. I had to stay really focused on my footing, so I didn't get to enjoy the scenery much. I wanted to keep my heart rate in Zone 3, and I was expecting my pace to be in the mid-10:00's in order to do that. 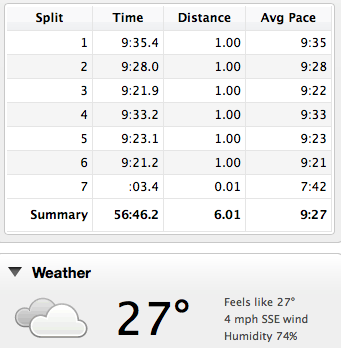 But I was surprised to see that I could run a typical "easy run" pace of mid-9:00's and my heart rate stayed put. I ran three miles out and then turned around. On the way back, I noticed that a lot of the snow/ice had been melting, so the way back to the car was much easier to find footing. My favorite part of the path is in the woods, and today it looked SO calm and peaceful, I had to stop and take a couple of pictures. 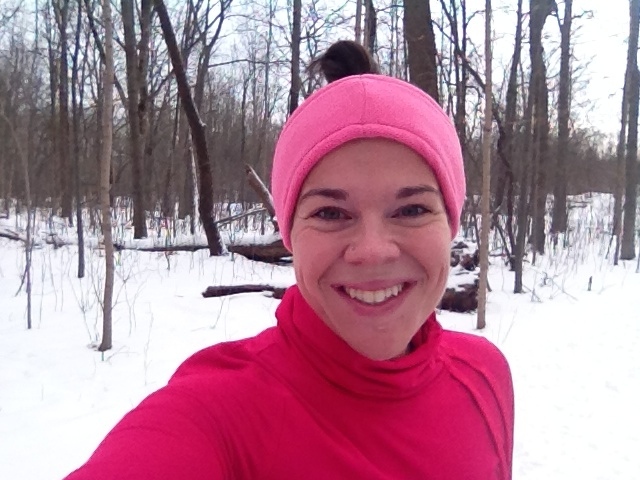 During the last three miles, I started to feel really happy and almost giddy to be running! The treadmill is certainly helpful in bad weather and when the kids are home, but it felt great to run on real ground today. The view of Lake Erie certainly didn't hurt. My average heart rate was in Zone 3.6, which was right where I wanted it to be. I felt really energetic on the way home, so I cranked up the radio and sang along really loudly. I was in one of those, "So happy to be alive!" moods. This afternoon, I called the nursing home to talk to Mark. I told him that I was going to come visit, and asked if there was anything he wanted me to bring. He said he'd like KFC for dinner. Jerry said he wanted to go with me to visit Mark, so we waited until the kids got home from school, and then all four of us went. 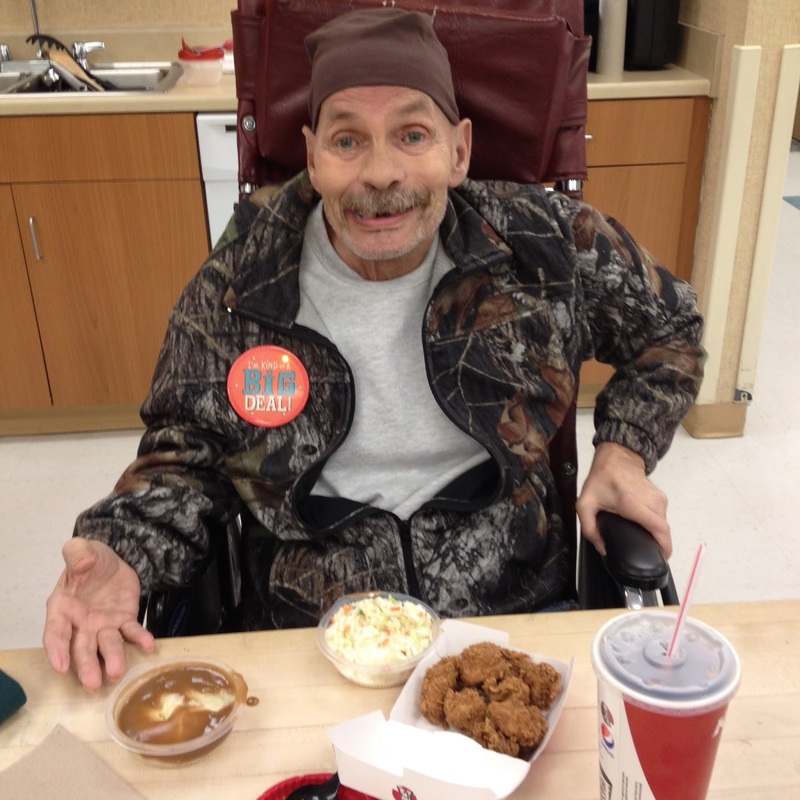 We stopped and got his mail, and then got his dinner from KFC, and went to the nursing home. When we got to his room, Mark wasn't there, but his roommate told us that he was in the physical therapy room. The physical therapist happened to be going into Mark's room to grab something, so he took us to the therapy room and set up a place for us to visit with Mark in there. Mark looked really good today, and was very talkative! I gave him his hats, and then opened his cards for him. He also got a couple of packages, which are fun to open. Inside one, there was a big button with flashing lights that said, "I'm kind of a big deal!". I thought that was so appropriate! I pinned it to his jacket. Mark told us that he had good news: He did his last radiation treatment today! It sounds like he'll be going home soon, probably within the next couple of weeks. He's really excited about going home, and I told him that we'd have a party with pizza and cake, just like he wanted. And then he pretty much melted my heart when he followed with, "But we can get a lot of frosting. I want everyone to be happy and enjoy it!" I told him we could do one cake with a lot of frosting, and one cake with a little bit, to please everyone. When we were getting ready to leave, we took Mark back to his room because he wanted to listen to a new CD my dad got him (Jackson Browne). I gave Mark a hug, and then when Jerry hugged him, Mark told him, "You keep her close, Jerry, don't ever let anyone take her away from you. She's a good girl!" awwww.. this post just made me tear up. i hope he can have his pizza party soon! Mark is an angel on earth. I'm still sending postcards weekly, I don't ever want your post office box to be empty. What you're doing for Mark is a wonderful thing, you've both been blessed by one another. A damn GREAT day! : ) Thank you for keeping us updated on Mark's status. What are some of his other interests? Music, movies, etc.? I'd like to send him something he could enjoy. How lucky you are to have Mark in your life! Your hats look great on him and he really looks like he is feeling good! What a wonderful blog. I'm in tears. You are such good people! Glad I live in a world where there's people like you. Glad your run went well and you were able to enjoy your "HAPPY TO BE ALIVE" moment. You deserve to have those! Being there for Mark is monumental. You are teaching your kids such HUGE life lessons by way of action. Keep up the good work! Aww, Mark is so special. And so are you!! Love the photos. That third pic is awesome!! Adorable, and you know he's telling the truth. He doesn't seem to mince words! Yep, just got choked up reading what Mark said. He's so special!! That was sweet! Made me tear up! Oh, the tears! Thank you! This post totally made me tear up too! Sounds like an all around awesome day. Bless you, Katie! I love the saying "happiness is a journey, not a destination", and your post really sums that up. Life is full of everyday happiness. I'm in tears too, how sweet is he? !